to meet your wants, needs and budget. Give us a call! (651) 430-1235! 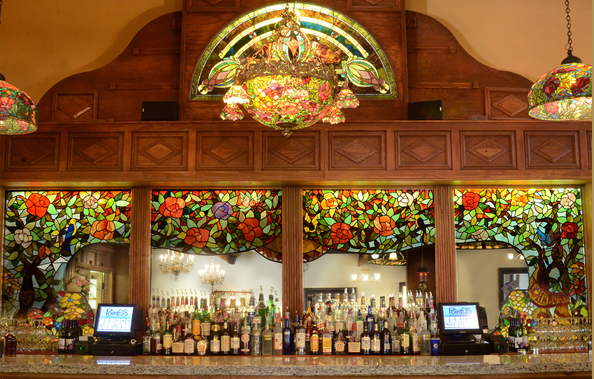 features beautiful stained glass decor, space for up to 350 guests, a generous dance floor and a very long stunning antique bar. The Grand began as a lumberyard during the heyday of Stillwater’s lumber boom. 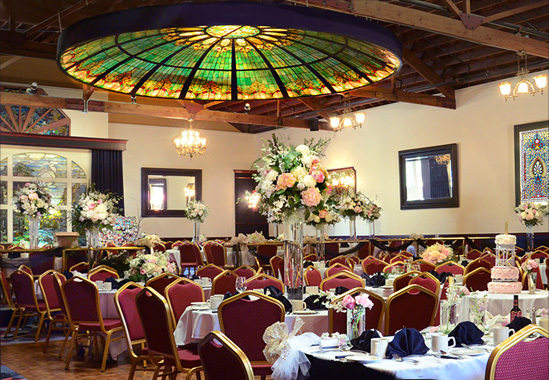 It was re-purposed into our beautiful ballroom in 1994. Left intact is the soaring ceiling with exposed lumber beams which now showcase our trademark antique stained glass dome. There are many ways that we can style your event. Round tables of eight are popular for weddings, whereas classroom style works well for meetings. Take a look at our banquet menus and select from a myriad of delicious choices, or work with Chef Chris to come up with a plan of your own. Please ask about our menu tastings. Price Guarantees: Food and bar prices are guaranteed only within the year of the event. Cake & Decorating: Cake, table favors and decorations are welcome. Call for timing of setup. Outside Caterers: No outside caterers allowed. Room Charge: Includes room rental and white linens. Other options available. Preferred Vendor List: Preview our list of vendors that we have worked with and can recommend, including florists, photographers, bakeries & more! Contract: You will be provided with a contract for your event – no surprises!